When I was a little un, Dad told me that sailors never cut knots.He explained that ropes were the life blood of sailing ships and had to be kept. patience is getting easier with age Di and yes the brick wall… I want to demolish it but our friend Richard said it’s doing a pretty good job on it’s own! we have a house inspection coming up at the end of the month with the new real estate agent, will ask for permission to knock it down & build a new fence out of sticks and string! Uhhhhhhm … Mo, I think mending cloth is a lot simpler than mending stone walls ! Hi Wendy, that’s a good idea, some stones with holes in them would work well! 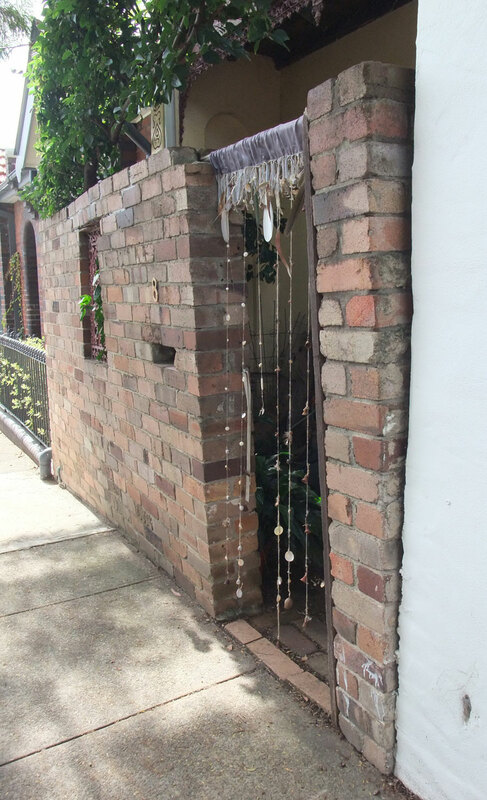 lovely mending, if you weight your curtain with holey stones you will be protecting the house at the same time. Oh yes! a mix of hagstones & cut crystals to make rainbows… Old Man Crow is a bit dubious though… oh ha, I am such an old hippie! Everything hangs by a thread. Nothing seems permanent. I love your noble efforts in behalf of the beloved jacket, the disintegrating wall, the love of life and living your works affirm. Love to you. Ah, the interconnecting threads of mending. And what bad mojo to nick your curtain! 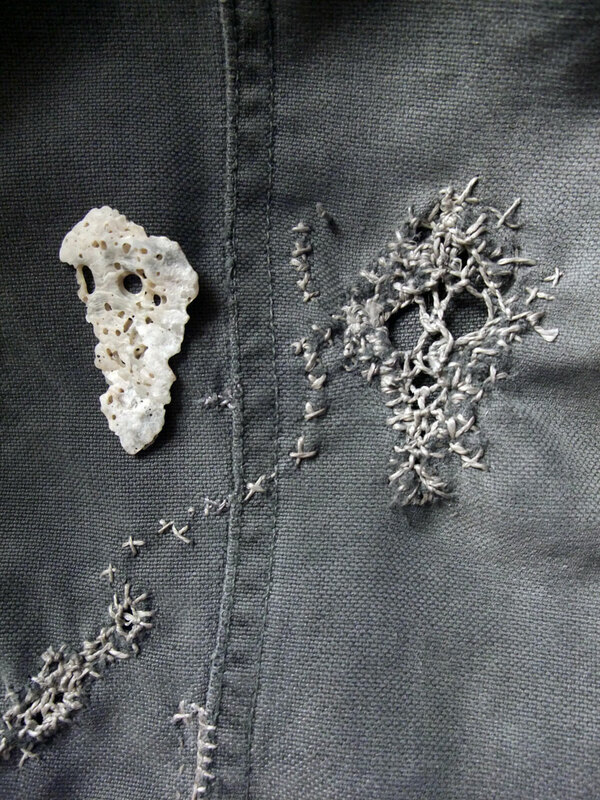 maybe mending holes in clothes is why we invented lace! 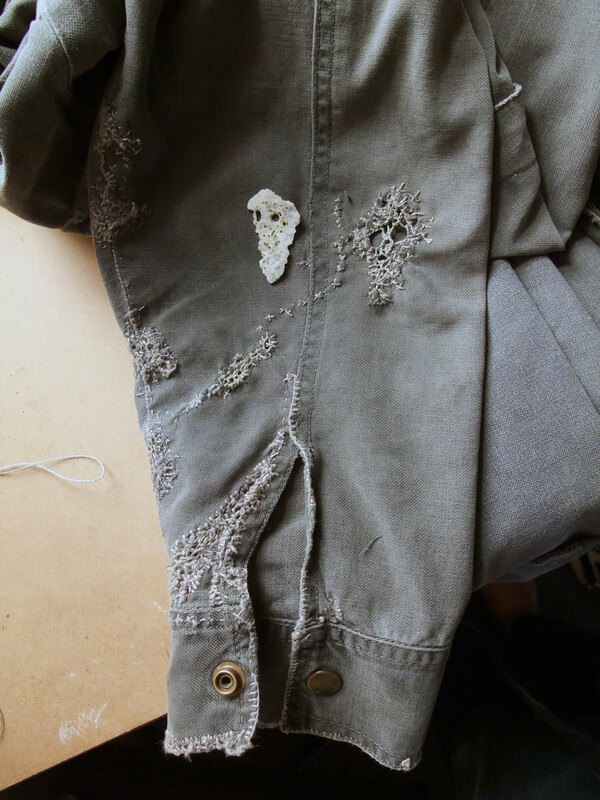 Your mending is just perfect, Mo, and it’s obvious that Old Man Crow loves his jacket. It really is becoming a work of art! Good luck with the wall; I hope you get what you want with it. The arch of bougainvillea sounds lovely. I hope who ever nicked your shell curtain has the odd moment of guilt but your new curtain is beautiful and renewal is good! I feel like just knocking that wall down this week before the inspection next Tuesday but Old Man Crow says no way, we don’t own it and can’t just do whatever we like even though the landlady does absolutely no maintenance… that is why the rent is affordable and we can still live in this interesting but getting gentrified at a rate of knots part of town! I love that mending Mo – what a gorgeous history – and functional too. Best wishes for the wall-mending as well! thanks Fiona, one day down the road it will be all lace! Love your work on the jacket and wonderful attitude to life, Mo. 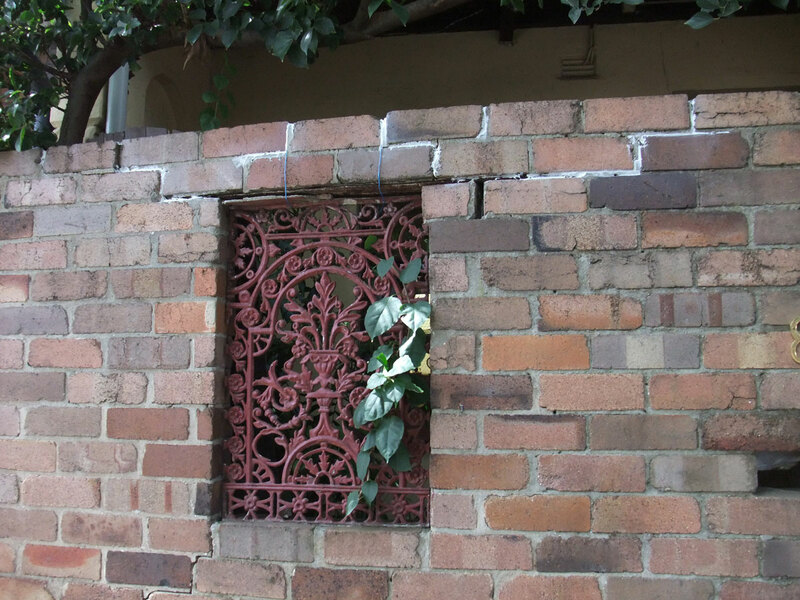 Hope your wall mending goes well, it looks as if it should be demolished! thank you to the link to Henrietta’s stitching. And also – I agree about your attitude to life itself. Your blog is uplifting – I’ve been catching up on old posts. thanks for the good words Judy!